Can you say swoon! 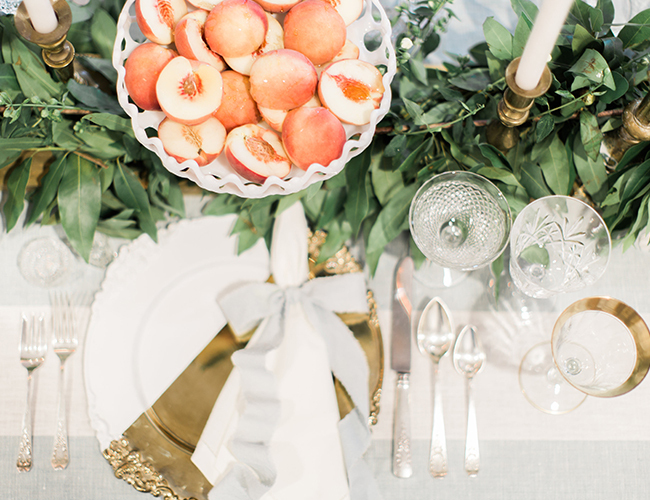 This peach estate wedding on our wedding blog today is giving us major Southern/French feels! It’s a beauty, for sure. 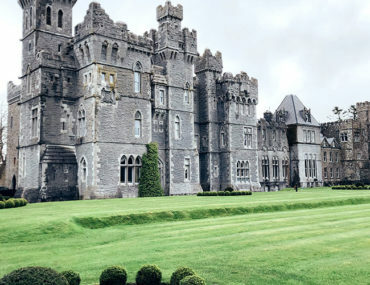 Lovelyfest, you made our dreams come true inside this gorgeous estate! 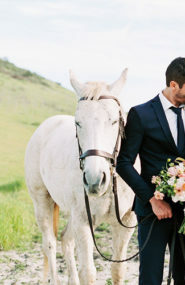 (Remember when they wow-ed us with this wedding?! 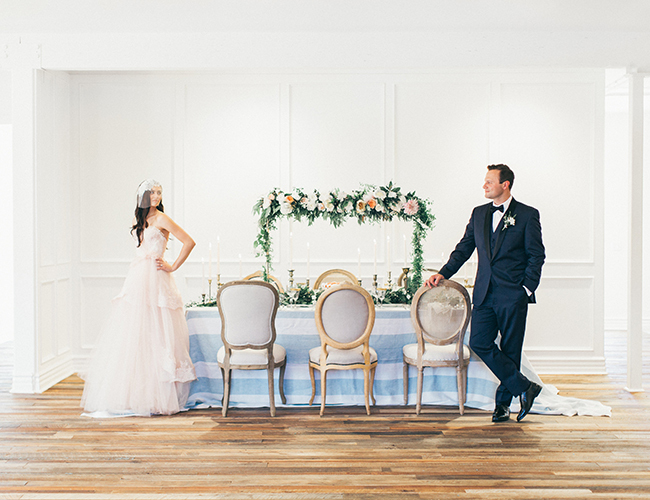 )Modern with both a two-piece and blush wedding gown, and vintage in venue, furniture, and decor – it’s a winning combination. 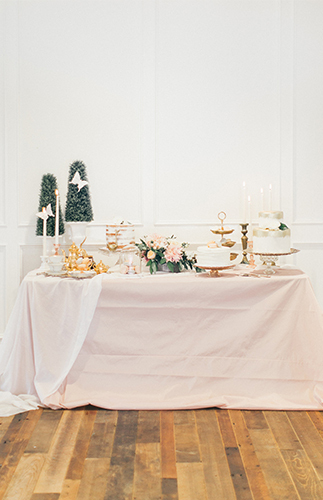 When creating a styled shoot, we’re always thinking ahead to what future brides want to see. 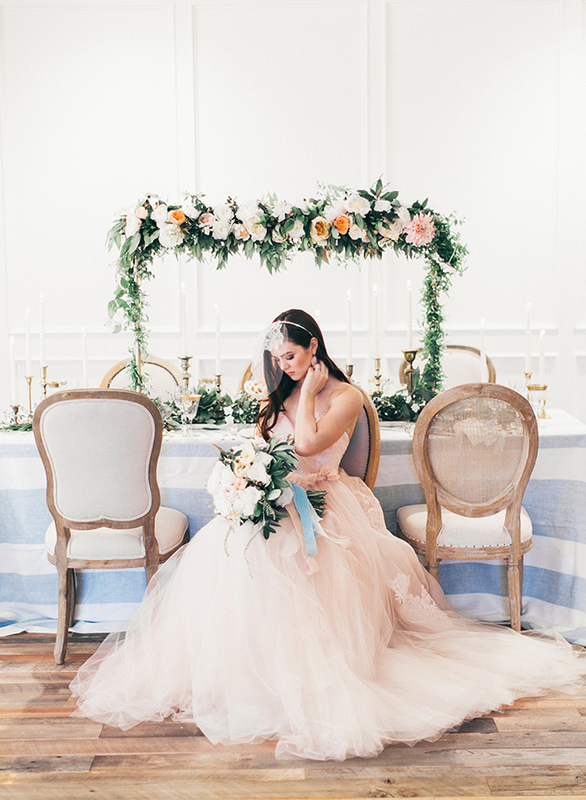 Romantic, airy, light and fresh editorials are abundant right now, and we absolutely love this trending theme because of one thing: it’s not trendy! 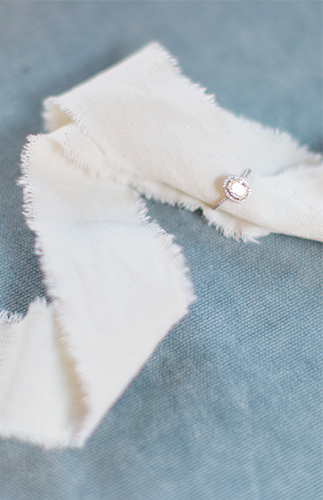 We think this is a theme that will stay in style forever, and romanticism in weddings is definitely not going away. 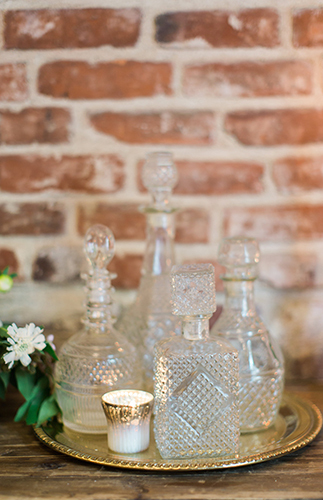 Being inspired by French architecture, gardens and fashion, we designed this shoot to have a romantic, French, industrial flare filled with simplicity and modern accents. 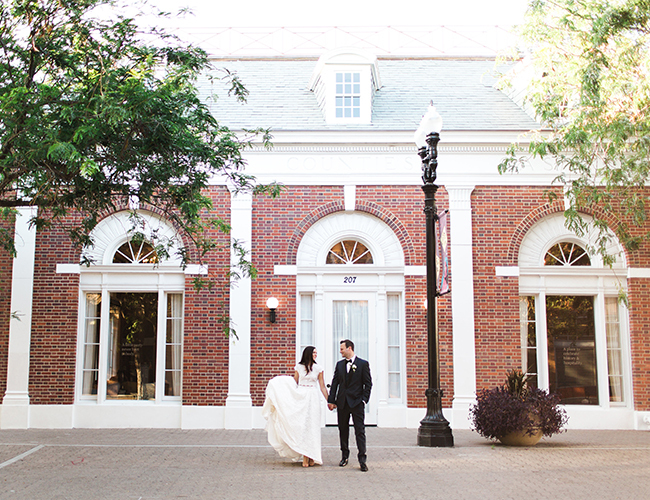 The venue itself is a newly renovated, historic building that has been around since the 1920’s, when it was frequented by celebrities like Lucille Ball. 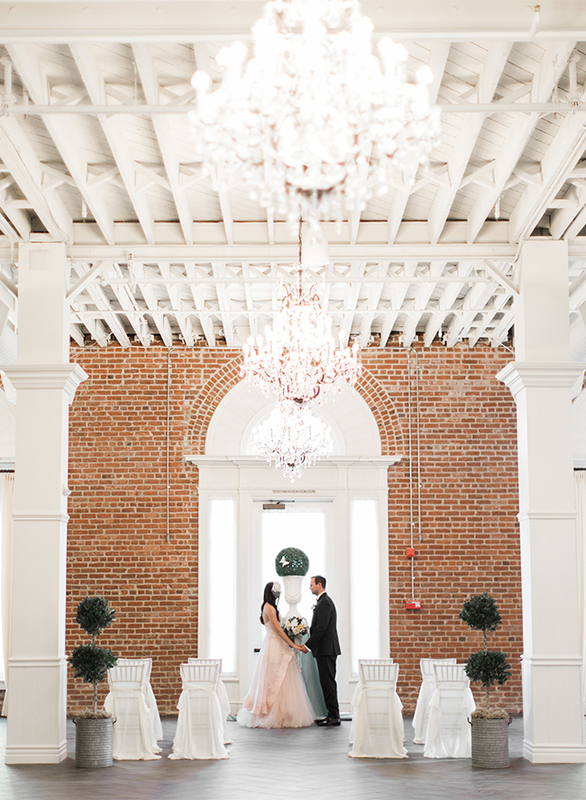 This history, mixed with the open beam ceilings, exposed brick walls, and arched Palladian windows of the Estate were incredibly inspiring to us. 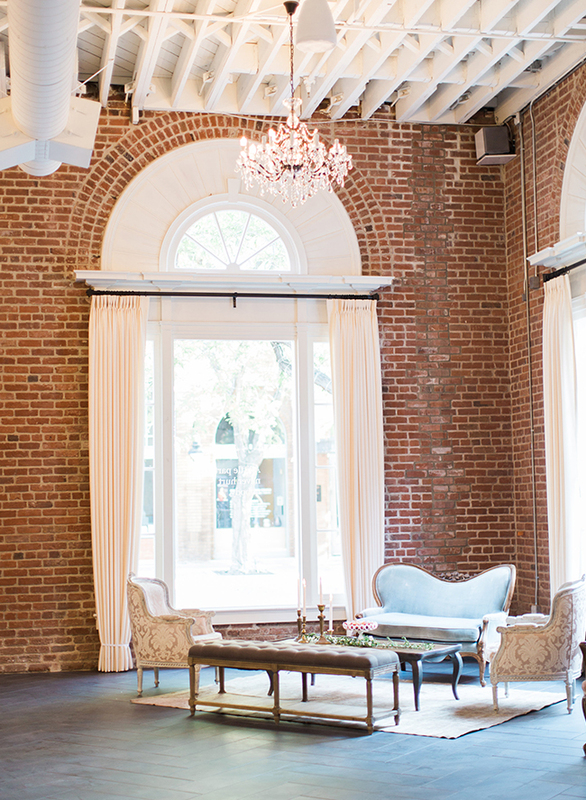 The clean lines, stark white trim, and symmetrical architecture provided the perfect spot for us to create a French, industrial wedding, and we can only imagine what it would be like to design an entire real wedding in this space. 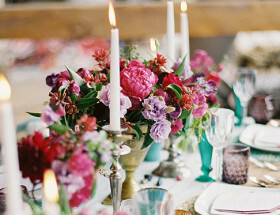 It is gorgeous and sophisticated and is set up to host parties big and small. 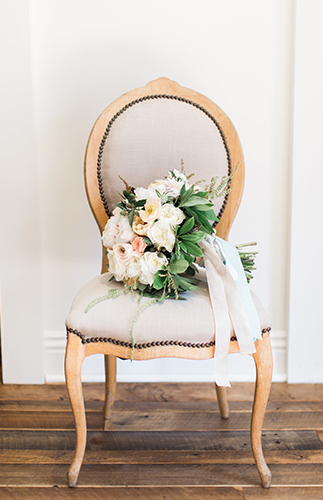 Keeping consistent with the idea of a French inspired shoot, we envisioned our bride as an elegant French woman on her wedding day. 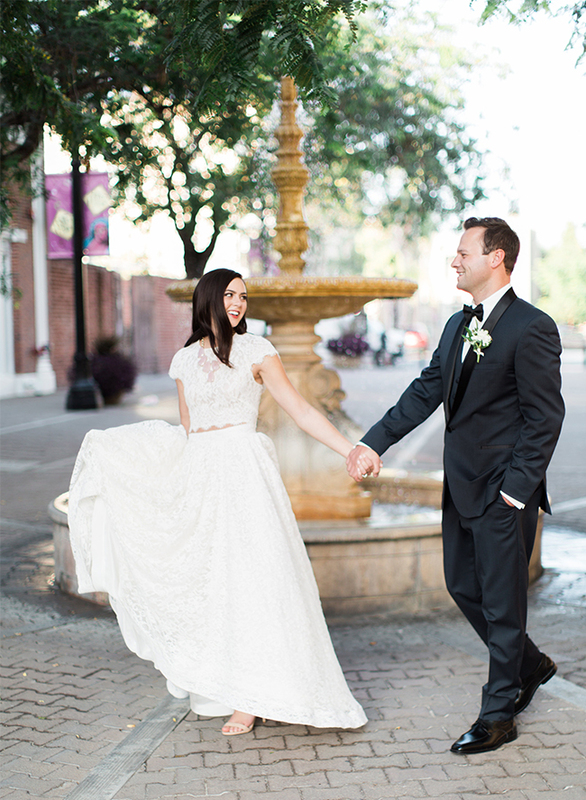 Celebrity hair and makeup artist,Joy Castandeda, enhanced our bride’s natural beauty and feminine features perfectly with soft makeup and classic hair. 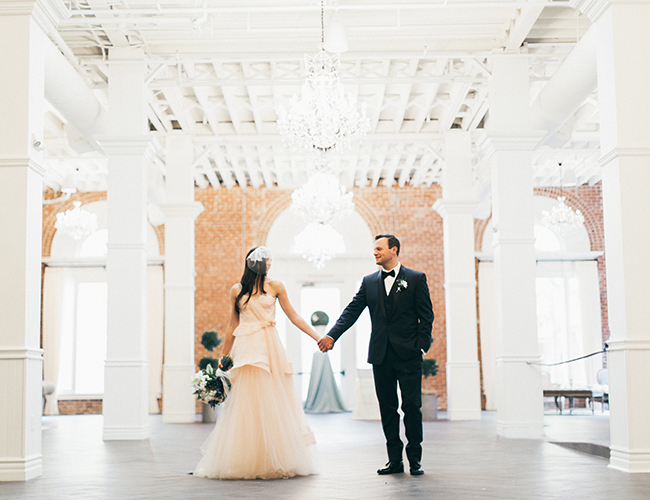 She then slipped into Claire La Faye‘s blush Swan Song gown, and our vision was complete. 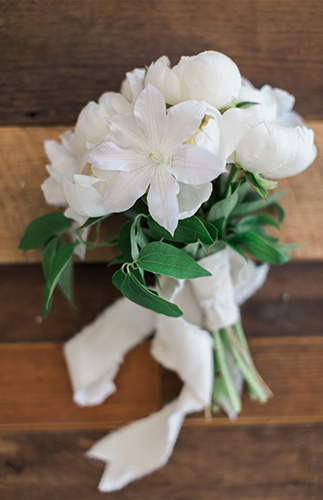 The intimate ceremony was set in the grand entrance of the Estate, with ceremony chairs draped in natural, flowing linen fabric and crystal chandeliers lining the tall ceilings. 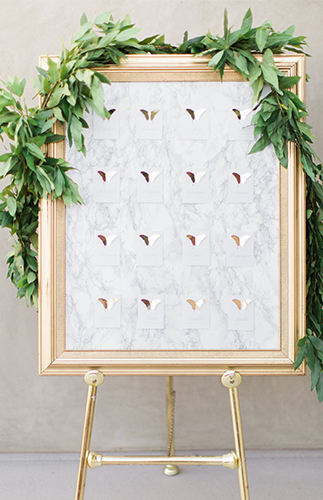 Our backdrop was made of a simple oversized topiary, reminiscent of ones seen lining the gardens of Paris. A few white butterflies accented the topiary, a subtle French theme we incorporated throughout the shoot. Cocktail hour was made complete with multiple vintage seating lounges from Archive Vintage Rentals‘ unique and timeless pieces. 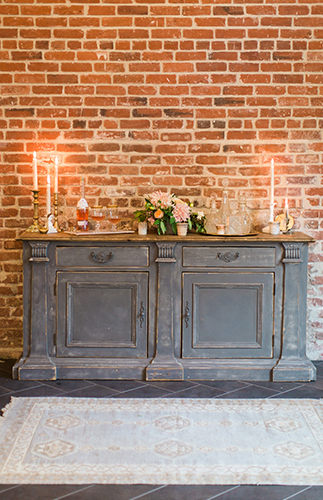 The Estate has a variety of nooks that are just begging to be filled with beautiful furniture, and guests love cozying up on these pieces with a good cocktail! Instead of a typical bar, this one was made of a weathered vintage hutch and was accented with Lovelyfest’s vintage crystal glassware. 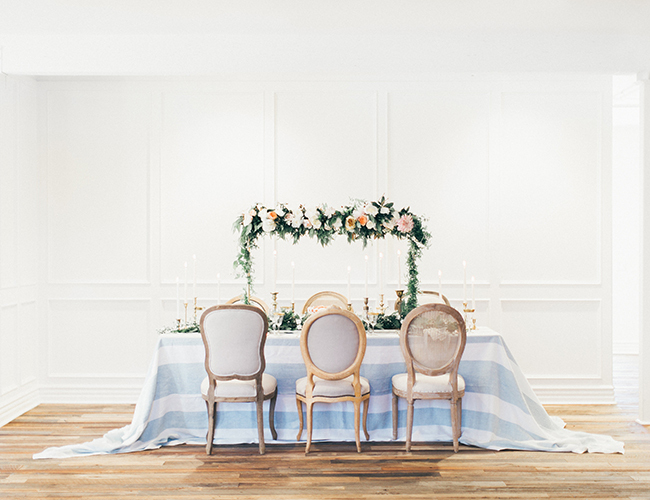 The second story is where we set the French inspired dining table, adorned with the most amazing French-inspired striped La Tavola Fine Linen and Archive Rentals vintage chairs. 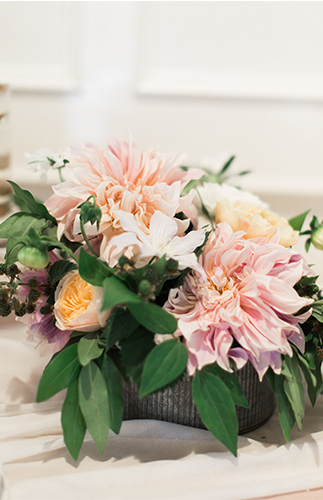 Together with Meagan Vos of MV Florals, we designed a unique floral centerpiece that lined the table in length and provided lots of height. 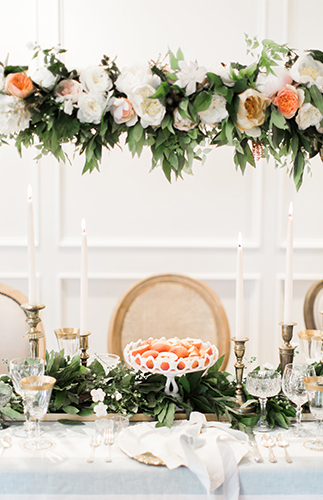 Meagan added beautiful florals and greenery to the custom structure and made it look like a true Parisian garden right on top of the table. 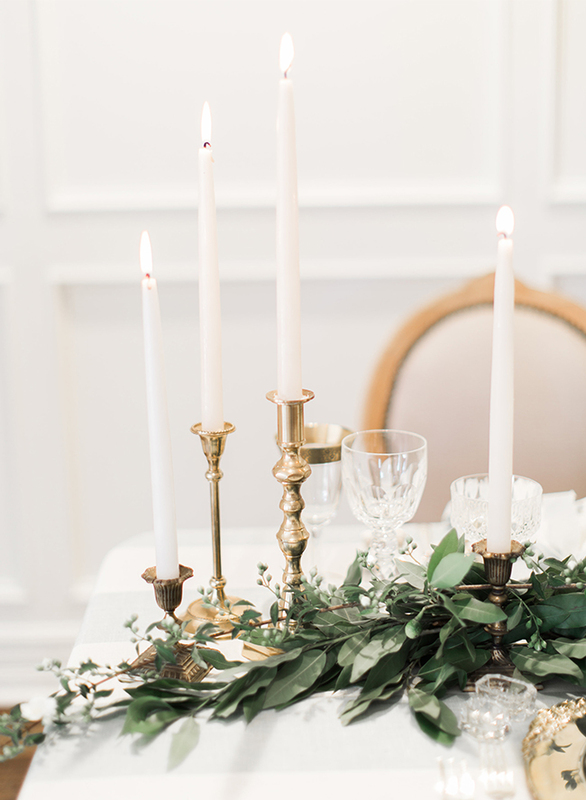 We accented the structure with vintage brass candlesticks for romantic light, and set the table with hand-dipped vintage gold charger plates, crystal glassware and salt cellars, and natural linen napkins. 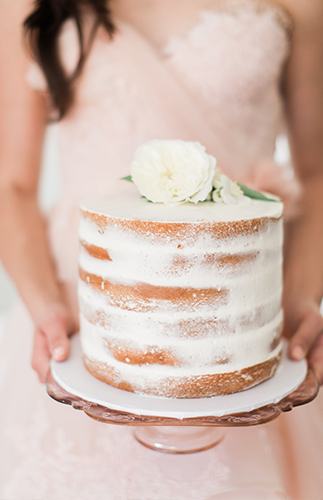 After the bride and groom cozied up amongst the table decor, they headed to the cake table, filled with adorable handmade cakes by Jay’s Catering. 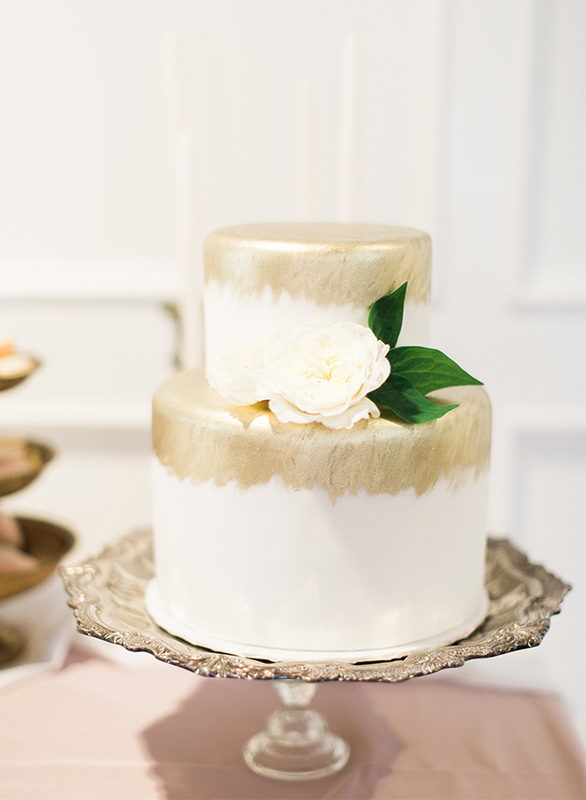 We love the simplicity of these cakes and fresh macarons, just as they would be in a traditional bakery in France. 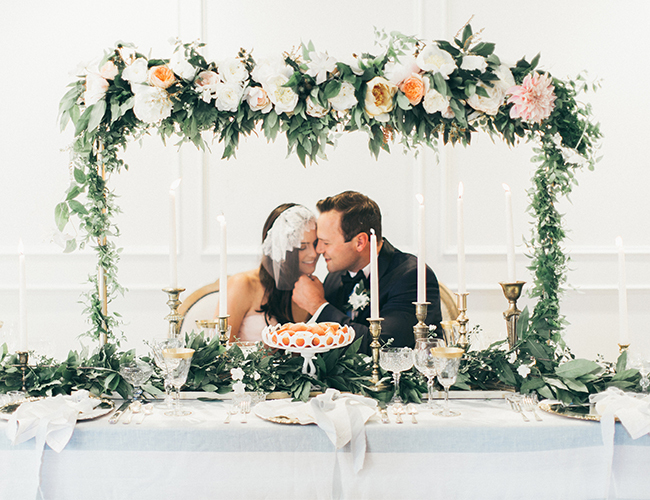 Obsessed with the flower frame over the sweetheart table! 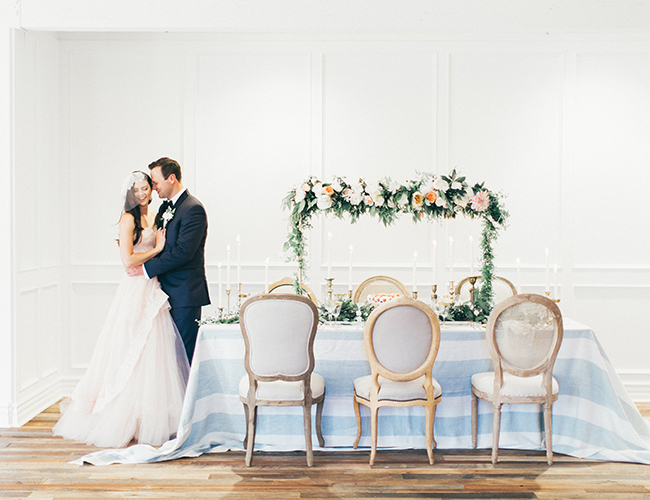 Everything about this is incredible – loving the historical venue and her blush dress the most!! Her dress is absolutely AMAZING! 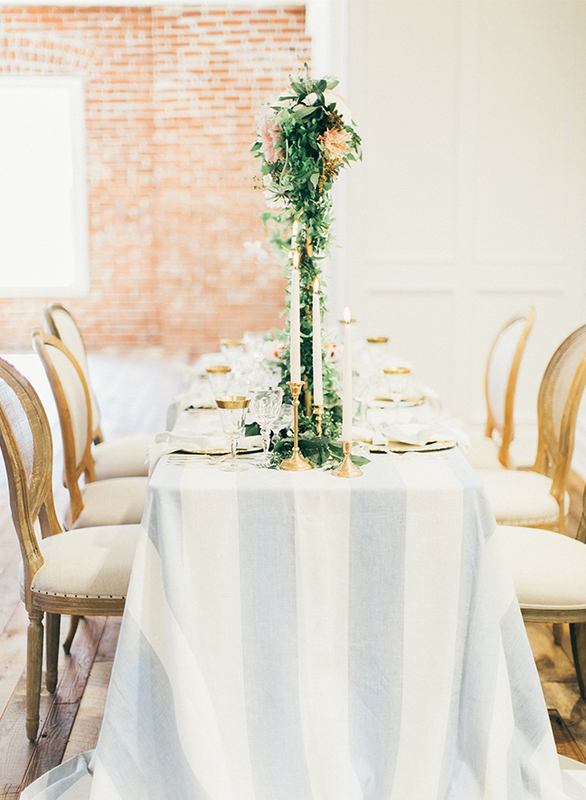 Obsessed with that tablescape and linen! So chic! Love the Parisian inspiration! Oh yes, love her dress!